Something that you should know about my family: we LOVE pizza. I mean really.We usually have a pizza night at least once a week, and I am not ashamed to say that some weeks we have more than one pizza night....Confession? Our Christmas Dinner tradition is pizza at our local pizza place... Is that bad? So, when Domino's gave us a chance to review their new Handmade Pan Pizza, we were up for the challenge! The folks at Domino's PR made it super easy for us, they worked out all the details! They even offered to arrange for delivery, but since we live in the sticks, we went to pick up instead! As usual, the folks at our local Domino's were super helpful and friendly, and within a few minutes, we were good to go! The first thing we noticed about the new Pan Pizza was the box. The pizzas were in these really cool all black boxes, which the boys thought were awesome. Tater even said "I thought we were going to Domino's! Those aren't Domino's boxes!" LOL. My kids know their pizza! We also got to try some of Domino's new Parmesan bites, and umm... I am embarrassed to say, that I ate them all on the way home. All 16 of them. I didn't even share with anyone else. Sorry folks. They were that good. I have found my new favorite snack! I had to keep the hubs from tearing into the pizza on the 20 min drive home, it smelled so good, he didn't want to wait! I have to say, though, that this Handmade Pan Pizza was worth the wait! We don't order pan pizza very often, I don't know why.. I guess I have always associated pan pizza with having a tough, thick crust. Well, I was so wrong. So, so wrong. Our family is all in agreement that this is the best pizza we have ever had from Domino's, and possibly our favorite pizza we have ever had. I didn't think you would really be able to tell that the crust was fresh, not frozen, but I could really taste the difference. This was not the pan pizza that I had grown up on! The crust was thick, of course, like it is supposed to be. But, where in the past I had experienced tough and yucky crust, there was none. This crust is something else, for real. .. It is thick, but tender and kind of melts in your mouth. It is buttery, but not greasy. It honestly tasted like the pizza that we get from one of those "gourmet sit down" pizza places for like $25 each! The folks at Domino's did a great job of perfecting the crust, and they also did a great job at perfecting the crust/sauce/topping ratio. 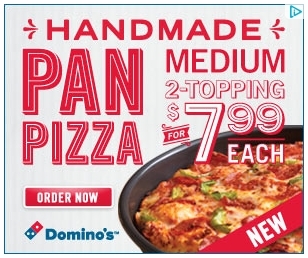 That is usually one of my biggest pet peeves with pan pizzas. Usually it is all crust, and no sauce or toppings. But, this time, Domino's has really got it right! I really liked the way that this pizza had the perfect balance of everything! We ate those pizzas up in no time! I can't believe that we didn't even get a chance to take pictures!! I didn't even realize it until the next day, when all the pizza boxes were already out in the trash! But, you will have to take my word for it, these pizzas were amazing! Domino's has really done a great job with this pizza, and I honestly don't think that any other pan pizza can compare to this! Great job, Domino's! We got to try Domino's new pizza free of charge in order to conduct this review, however all thoughts and opinions are 100 percent my own.